Moving From Pandora to Spotify – WOW! I had a paid subscription to Pandora for years & was generally satisfied with the service. I was also happy with the $3.99 cost for commercial free streaming music. This is an older chart but you can get the general idea of how the services differ. So I switched to Spotify. They had a promotion that gave you 3-months for something like $0.99 so it was a no brainer to try it out. I wasn’t able to convert my playlists from Pandora but it was easy enough to start typing in my favorite artists and flagging them as favorites. Then Apple released their new music platform. Same price as Spotify and same size catalog. They’re giving away a 90-day free trial and I’ve tried it. The Apple Music interface isn’t as intuitive as Spotify but it gets the job done. Now I’m torn. Do I switch again (to Apple Music) and take advantage of it’s tight integration with IOS? (Hey Siri, play The Church) The OS X interface uses iTunes which needs to be burned to the ground and rebuilt to from the ground up. Spotify’s OS X app is pretty user friendly but takes some 3rd parry apps and plug-ins to make it integrate with the OS (and use the play/pause controls on the Apple keyboard. Is there another streaming service that beats Apple & Spotify? I’d love to hear your feedback on what you use, what you like, & what you don’t like. Author Andrew EverhartPosted on September 8, 2015 September 6, 2015 Categories Entertainment, Review, TechnologyTags Apple, Entertainment, MusicLeave a comment on Moving From Pandora to Spotify – WOW! Online TV – Which Network Does it Right? Don’t you hate it when your favorite show gets interrupted by local or national news events? This is especially true when using a DVR and you might not realize your show was preempted until a week later. Enter the streaming features just about all of the major networks are using as another avenue to get their programming (and advertisements) in front of you. 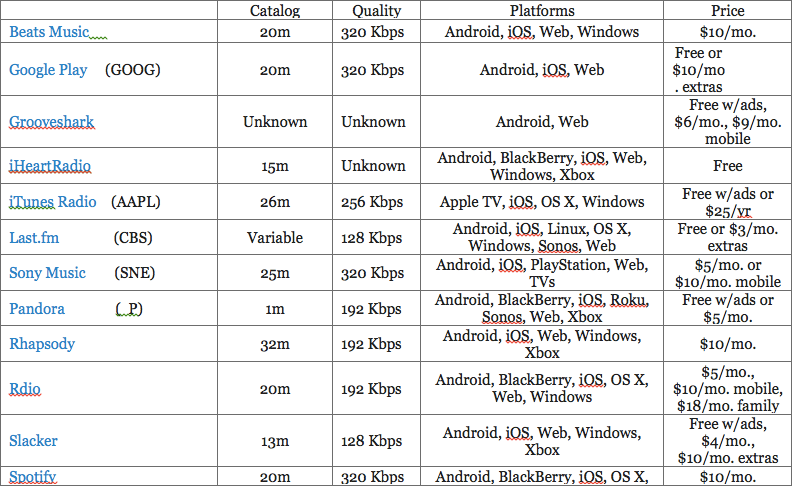 Not all of these networks treat online video the same though. Some sites tease you with clips and previews instead of making the entire show available. Other sites only show 1-2 recent episodes and leaving the older shows to collect dust until summer re-runs (or syndication). Some sites such as Hulu have a great selection but put all of the good content behind a subscription fence. Another site (I’m not sure how legal this is) called justin.tv allows users to stream their TV to the web. This is really helpful when local games are blacked out or delayed (i.e. Indy 500). As of this writing Justin.tv had 2,606 live channels on their site. I’ve thought about dropping cable TV all together and relying on online content and Netflix but with all of the existing restrictions imposed by the networks it’s just easier to keep things they way they are. Bit Torrent, legal or not, has the content (so I hear) but automating the entire process and making it available when you want it is something that’s just not there yet. Not to mention the legal aspects of downloading copyrighted content. I remember hearing the president of NetFlix saying something about not shipping DVD’s in 5-10 years. Maybe then the content will be easier to package and deliver digitally through the Internet. Can the Internet itself handle this increased traffic load? Is Bit Torrent and peer-to-peer technology the answer? This is going to be an interesting issue to follow. How do you get your entertainment content? TV, Internet, DVD, other? Where do you see content delivery changing in the upcoming years? Author Andrew EverhartPosted on June 4, 2011 Categories Entertainment, Technology, VideoTags Cloud, Entertainment, Movies, TelevisionLeave a comment on Online TV – Which Network Does it Right?